Blewett started ninth, but patiently worked his way towards the front. He finished a season-best second. Having Blewett in his tire tracks late in the race required Beers to play it cool. He was able to do just that with a little help from his spotter Michael Boehler. “He really kept me calm over the last couple of laps. John was all over us and Michael told me to run my line. He told me to keep it to the bottom and make John pass me on the outside. He did a good job. There’s an age-old question in racing. When somebody wins a race is it because of the driver or the car? 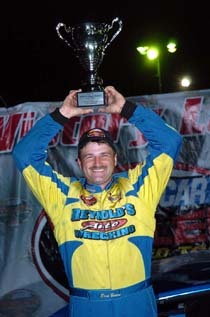 Well, Saturday night at Seekonk Speedway (MA), it had to be a near 50/50 mix when Eric Beers took the #3 car to victory lane in the 150-lap NASCAR Whelen Modified Tour feature. On one hand, Beers won with a team that is probably the most storied operation in Modified racing today, maybe even of all-time. The #3 cars have been owned by the Boehler family for nearly 50 years. Bugsy Stevens, Fred DeSarro, Ron Bouchard, Tony Hirschman and Jerry Marquis are just a few of the Hall-of-Fame caliber drivers who have driven the “Ole’ Blue” #3 throughout the years. On the other hand, Eric Beers is a hard-nosed, old-fashioned racer. He races hard, he races clean, and he races as often he possible. Beers enjoyed his battles with both Christopher and Blewett. Beating those particular drivers only made his win more meaningful. “I’ve raced with Ted awhile,” said Beers. “We’ve raced together at New Smyrna every year since ’94 or so. We’ve followed him in some races and kept it clean with him. Tonight, he kept it clean with us. You appreciate things like that and the next time that he races with me, he’ll get the same respect back. Beers’ two rivals had very different nights at Seekonk. Christopher led early, faded a little bit later and then got booted around on the front stretch to lose a ton of track position near the end of the event. That incident led to TC being very agitated (we’ll have his reaction later this week in Modified Leftovers right here at Speed51.com) and dropped him to a finish of 17th. The weight of winning with “Ole’ Blue” was not lost on Beers. The victory came at the team’s home track and in front of a grandstand audience who got the opportunity to view a restored #3 Coupe that was on display in the grandstand area. And at Seekonk, he had to beat two of the hardest chargers in Modified racing to get the victory. 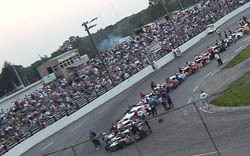 Beers took the lead from Ted Christopher early in the race and he held off a hungry John Blewett, III to hold on to the top spot at the finish. And whether it was 1975, 1985, 1995 or 2005, some things in the Modified world never change. That meant Beers had some big shoes to fill when he took the #3 ride this year. As excited as Beers was to win, the close-knit Boehler family team was equally thrilled. Speed51.com will have more from Seekonk in our Modified leftovers later this week.